‘Interdisciplinary Mediation – Facing global disparities and current conflict of international interest.’ As an addition to the main topic Prof. Andrew Goodman held a workshop on ‘Training Standards and Training Stories’ to a group of international experts from 27 different jurisdictions. A wide range of views were expressed on trainer qualifications and experience in mediation training. For example, it was said that in British Columbia there is a minimum requirement of 18 hours of training plus assessment and 10 paid mediations. Also, it is a requirement to complete a certain number of mediations per year to remain on the roster and 20 hours of Continuing Professional Development. On the other hand in Italy, in order to become a trainer, you are required to work within the mediation institute and also to complete 18 hours of training for mediators with a non legal background and 2 hours for lawyers. Australia has a prescriptive model under family law with a requirement to demonstrate 39 hours of training plus assessment and 25 hours of mediations every year. Delegates also gave their insights into training practices in Germany, Austria, Hungary, the UK, Spain, and Poland. This highlighted the different rules for mediation from country to country and, in some cases, how it is not well established or discussed. Additionally, Prof. Goodman conducted an interactive exercise where participants were giving examples of mediation trainer and training requirements. He said that a good educator should be able to transfer theoretical and practical knowledge and therefore her or his ability to teach can be assessed in order to achieve this it was suggested that at least 3 years working and teaching experience is required, together with the ability to convey these experiences throughout the course. Excellent communication skills were mentioned as an asset and there was also a suggestion that having the ability to carry out training in business skills is important as it is needed for mediators who are just embarking on their career. Regarding the training it was reported that, primarily, it should be focused on consumer protection and that there should be a quality insurance and a national body in order to provide accountability and transparency in the delivery of the service. To conclude this session, the well known examples of how to share an orange between two brothers and how to divide 17 camels between 3 sons were given to illustrate the type of positive outcome of that can be achieved by mediation and the need for further developing the topic of ‘training standards’. In general terms, the WMO symposia focused on ‘Mediation and Crisis Management of current international interest.’ This particular conference offered four busy days and a variety of speakers from different fields and different countries. 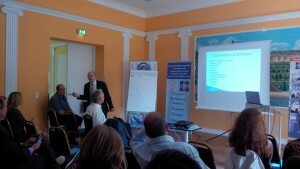 There were lectures about ‘The Lengths and Limits of Mediation’ by Dr. William Zartman (http://www.sais-jhu.edu/i-william-zartman), ‘North-South Korean Conflict’ by Roland Wilson and ‘Restorative Justice: Chances for Victims and Offenders’ by Patric Illigen. All other sessions represented a range of different workshops that gave a fruitful opportunity for discussion and debate on many issues related to mediation, global peace, and also training and professionalism. An interesting point of view was offered by Beverly R. Tarr who highlighted the importance of ‘Professionalism in Mediation’ in order to address ethics, credibility and integrity of the mediator. She advocates the establishment of a regulatory body, code of conduct, and disciplinary board. In her workshop she stated that accreditation and continuing education is a must. Ms Tarr also pointed out the necessary qualities of a mediator, stating that being relevant and current in the society together with respect, humility and compassion is are basic need requirements for a professional mediator. The ‘Mediation Synopsis’ workshop introduced by Maria Theologidou focused on the foundations of rhetoric and its connection to mediation. She reminded delegates that good mediators should master social intelligence ethos, by suspending judgements and maintaining their integrity and credibility; emotional intelligence pathos, by appealing to the emotions and by sharing empathy; and intelligence logos, utilizing logical argument and by knowing what they can expect and what they would like to achieve. All these are not possible without education and previous preparation. Establishing norms for mediation training worldwide would appear to be a milestone in achieving professionalism and respect within society. 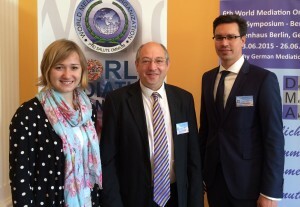 It is necessary to invoke the importance of the quality assurance and therefore the WMO symposium in Berlin provided reassurance that the AMATI mission is right and accurate and that there is a degree of urgency required in order to preserve high standards in mediation training, assessment and certification.